After you view the website please click on the contact us form to provide feedback, ask questions and make comments. The program includes the use of an internet based diabetes registry, training for all clinicians and office staff on how to use the registry and standards of diabetes care as well as training for group visits. To access DMCP user's manual that describes how to enter data and use the program click here. This manual has screen shots and instructions for most reports that can be obtained from the registry. It is a very robust and user friendly tool. To find published articles describing the many features of the diabetes registry click here. For information about how office practice teams use the registry to increase quality and performance click here. Click here for a comprehensive news article about the DMCP with quotes from several users like Drs Saver (Vero Beach), Scuderi and Dimtrov (Jacksonville), Ramdeen-White (Melbourne) and CDE Kathy MacNeill (Heartland Rural Health Network). Click here for information about how the Heartland Rural Health Network uses the DMCP. user and a patient describe thier experiance with the DMCP click here. Click on banners at the top of this page (e.g. group visits) for additional pages with more information about Diabetes and the DMCP. 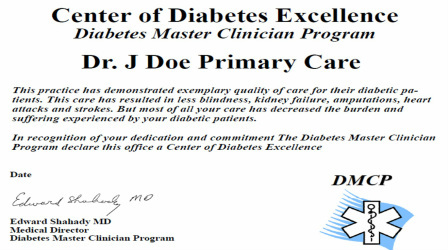 a year and increase their quality data by 10% are awarded certificates as Diabetes Master Clinicians. 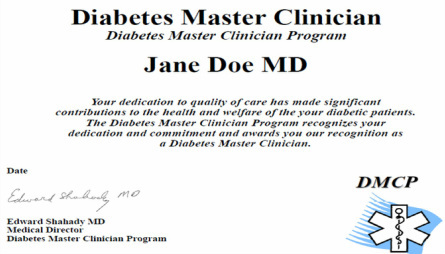 Their medical assistants and nurses receive certificates as Diabetes Master Clinician Associates. The office will also be considered a Center of Office Practice Excellence. Examples of Certificates below.